Having trained with a Guru in the art of music and dancing as a child, Pandit Suman travelled the world sharing his gifts and talents. Despite his successes abroad, Pandit suffered his own fair share of tribulations back home in India, and today shows that the most important thing is to remain happy and resilient. My name is Pandit Ram Chandra Suman. Pandit means — it was when I was honored, they gave me the title of Pandit. If you are quite spiritual in music, you are given this name. And this was only for the honour. And who gave you that? This is the government of Bangalore; Indian Bangalore. I was born in Mathura, where the Krishna was born, in 1932. And then I was brought to Delhi, when I was two years of age. My parents brought me; my father got a job at the DGM Mill and he was working there, and my mother was busy with the cows and the buffalos and the milk. 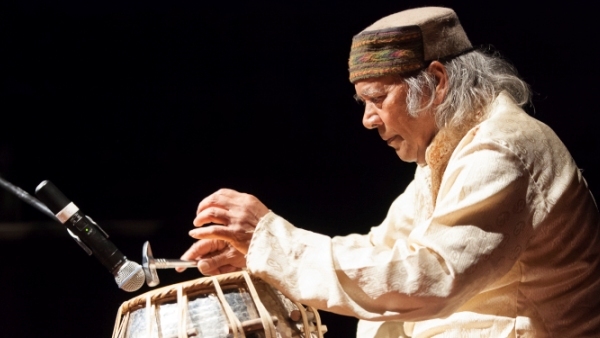 And when did you first start learning to play the tabla? That was when I was nine; there is some director who used to come to the school and they used to… What do you call it? Get the introduction of how many boys and girls are able to dance or sing, how their movements are. So then they selected me, they took me, and they taught me one dance, and then they [told] me that you must play tabla so you can have more understanding about rhythm. That’s how I started. And do you remember that? And what part of Delhi? This is right in New Rohtak road, it’s the name of the city and Old Rohtak road, the two roads merge together. And is it South? North? It is North, in North Delhi. And you had siblings? Brothers? Sisters? Oh yeah, I had two brothers and two sisters. And your parents? Were they interested in music? My maternal uncle was really in the deep into [music]. He had a group; he used to go here and there and perform. Because of that, I learned when I was small. He used to travel and then I was brought to Delhi, [at] two years. He used to take me in his lap and put me down, and they were dancing and I’m watching it and I’m really happy to see that. The Indian style, like, mixed a little bit like Bollywood. Light dancing, not classical. And he was self-taught, or he would have had a Guru? He had a Guru… he had a Guru and he was able to play harmonium, pedal, and both hand like piano, and tabla and singing and dancing. And when you started becoming seriously interested in music, who was your teacher? When they found me, after three years, I was working in the drama — learning acting. They found, ‘We haven’t got anything to teach him in tabla and dance, then we have to take him to introduce to Pandit Chiranjilalji’. That is what you call, Jaipur Gharana (Jaipur tradition). There were three brothers, Sundar Maharaj, Narayan Prasad, and Chiranjilalji, they were all good in dancing. So this was when you were still at school — at Primary School or High School? So they thought you were a talented boy. And who paid for you to have lessons? The club. The club sent me when I was promoted pass in Class 7, [which is] more or less a fail, because I was not able to take study at home. So they sent me to the college and they were paying fees; they were paying for books, for everything. What was the most important lesson your teacher or Guru taught you? So you had your own tabla? My own tabla, yeah. So, when I let him know that this [is what] I have composed, he said ‘Yes, this is good. At least you have done this much, that means you know how to go in Year 5’. And what age were you when you stopped seeing that Guru? I was around about 30. So were you playing professionally or did you have a job? I was having a dancing program, I used to make a lot of money… 15 programs in one month. Actually sometimes 50 rupees, sometimes 100 rupees. Ok, so we’ve only talked about tabla, but you were mainly a dancer? Dancer, pakhavaj (a horizontal drum) player, Kathak. And who taught you to dance? The same Guru? Same Guru, Chiranjilalji, and the first one also knew the light dancing, a little bit classical. They said, ‘You have done it and we cannot teach you, so we’ll leave it there’. So I used to go walk down, one mile back, one mile go. And who were you dancing with? Like a group or just solo or what? Oh, they do the dancing also (the Uma Sharma sisters), and I used to be learning from Shambu Maharaj. And I also gave him a hand to play tabla with his students, and so that’s why I know quite a lot. So you could make a living? You were making a decent living. Yeah yeah, there was nobody but me. And were you teaching also? Yeah I was teaching also. I was teaching when I learnt, when I went to Chiranjilalji. And so you would have been married by that time also. Yes, something like that. I was married at 28 years. 1967… maybe I’m making a mistake… 1967, my son was born after nine years. First one died, and she was very very sick for that, and then he was born in 1967. I left him in the hospital, she gave birth, and I had to go, the government sent me to Expo ‘67 World Exhibition. Great exhibition, nobody can see, nobody can get this chance what I have seen in my life. That was in Delhi also? I was still in Delhi most of the time, but I used to travel a lot. Program here and there, sometimes go with the group, sometimes go do it with the dance. So tell me, how did you end up in Australia? I was in Fiji after we finished the work from Canada, and we did a lot of programs… we went to London, we went to America, so many places… like California, Chicago, Boston, all those places. My dancing what-you-call, the organiser. Those who organised us [said that] you have to lose your — change your passport. You have to have your own passport; we were given white passport, VIP. And then we changed that one. The number it is still in my old passport — the white passport, the number is different. And so I said ‘Okay, we’ll change’. So we changed, and they paid the money. And then… after that, we came back home and one very big meeting was happening about the airlines. And all the managers, organisers came from various countries in Ashoka Hotel. In Fiji, also, the manager was there. And when we had a dinner and everything, then we had to play about 45 minutes for them. And they liked the dancing, they liked tabla, and they said ‘Why don’t you come to Fiji? I’ll send you the tickets. How many of you people could come? I’ll need the dance doing that, and classical dance, and this sarod and tabla’. So photos are there. And did they offer to look after you whilst you were there? Yeah, yeah. They look after everything; accommodation, food, and everything. For two months… and then I stayed there. Because I liked Fiji, that I can learn some English… they are broken Hindi, and [I am] broken English. And then my Hindi was good, as I told you, they sent me to college. That is in Delhi, my drama people sent me to college to study Hindi so I can pronounce properly all the words… and that’s why my Hindi is good. And so when you’re in Fiji, you had a wife there? You were married there? Yes, yes. Not there — when I was going to India, and my wife was pregnant. Then, we were living in Nadi, so my sister and two brothers were getting married, and I was [like], ‘Look, I have to attend these marriages, and I’ll come back’. And she wanted to go with the church people to New Zealand, so I said ‘Okay, here is $350, buy a ticket. And this is something for your pocket money, and you come back and stay nicely’. And she started crying, ‘Oh you won’t come, I will be alone here’, so [I said], ‘Okay I’ll just put the sign in one of the office of marriage, will you be happy? I will be back’. So that’s how we got married. And in Fiji, one English lady used to come — especially on the yearly Hibiscus Festival. So once, me and Ashok Roy was playing, and she came to listen to music because she is a musician, she is a pianist. So she said, ‘I like your music, why don’t you come to Australia, I’ll send you the ticket. And you’ll have to lecture at University also, the Sydney University’. So we thought, why not, we can come. So Ashok Roy was also in Fiji, he was also teaching. He came by the Indian government, he was getting very little money. So he was your friend? Yeah, I met him in Fiji. We did many programs. So you left Fiji to come to Australia, for a visit. Yeah then after that, [Ashok Roy] came to Australia. He applied, and then [the English pianist] said ‘Yes, I want to see him, he’s a very good artist’. Yes, and same with me. So she said, ‘I have to spend the boarding and lodging and all those things, why don’t you apply for the citizenship to enter Australia?’ So I said okay. I used to go many, many, quite a few times… maybe three months once, four, five times sometimes, to give lectures and demonstrations while I was teaching in Nadi Secondary School in Nadi. Hindi, I was teaching, and Fine Arts. Also Gardening. Yeah, the bloody stupid people, they grow sugar cane, they never grow vegetables. Yeah. And the kids don’t know how to grow it, they only put the bloody seeds and they plant the sugar cane, and that’s it. So I learned English there, and then one of the ministers — what was his name? — anyway, so he was teaching English. He was a good Education Minister. He became a politician, but he used to teach with me. So I was there with Vivekanan — that was his name — I said, ‘Vivek, can you please translate this Hindi?’ So he knew Hindi very well, because he belonged to Pandit family, those who knew the Sanskrit also, and he said ‘Okay’, so he translated in English. So I said — I was not fluent English at that time, only little bit — So I said, ‘Can you read this?’. He reading, and I’m writing. So all my questions and answers I wrote in Hindi, and then talking in English but reading Hindi. Once we were having a party [at University], and they asked me a few questions, I said ‘I don’t know English’, [and they said], ‘I could hear you were talking very good, what do you mean you don’t know English?’ Don’t know, this is my English. We won’t call it cheating. What do you mean? This is an art. Yep, it’s the art of cheating. How long have you had your school in Bankstown? Since 1987, since then. Because I got the proper room, and before, whenever I went up there I was very close to Nancy Grover, when I was called in Liverpool Street. But the people were very very funny, roaming around on all of them drugs and needles, and doing the things and exercising right on the road. Because of the brothel place. And so who’s Nancy Grover? She was the lady who originally convinced you to come to Australia. Yeah. So that’s how I’m here. And you bought that house isn’t it? Muted, not the same. Tell me something about fusion, fusion music. You’ve just done a project with Pepa Molina who is a flamenco dancer, what do you think about using traditional Indian rhythms in other forms like that? Well actually, it was easy for me. Because they are doing, more or less, Kathak. But doing with the shoes on. We don’t do that. So, she’s not — what you call — doing that style, correctly, but she’s quite blunt, but very strong. I have met quite a few Spanish people… and I had about 5-6 programs with them. So you’ve done some Flamenco before? Yes. When I have done it with Kathak, it’s nothing, it’s easier. In Sydney also. So my idea wasn’t original, I’m sorry. And you enjoyed working with Pepa? Oh yeah, that’s good. Healthy and happy, no worries. Good girl. So these questions are from someone else; where did you learn about her, and why did you want to collaborate with her? Well the answer is, I introduced you basically. Yeah I wanted to show that I can play. Simple as that. And get a little bit of money also, hopefully, for the job. That’s because of you, money was in your hands. And do you think it’s a pretty — the Indian/Spanish collaboration — it’s a pretty natural kind of one? It is natural, it is natural actually. But because like, before, they used to live in India. When they left their country, they became rich — you know when you make the iron hot and then beat them — blacksmiths, they were blacksmiths. And they used to take the dig out and put in lots of charcoals and food and everything, and they used to make the horseshoes and even kitchenwares. All those, they like all those things. So this is the thing. How do you think these forms of expression can be used to tell Australian stories? Why not? You can! In Kathak, you can. Kathak, Flamenco, what sort of impression, what sort of steps you are using according to the story. The story is very very heavy, some hot talk is going on, and it’s different. Very very mild going on, and very very happily going on, and very very melancholy going on, all the expressions on face and through the body, you have to express so they could understand. The body language, it has to be very very necessary, important. That’s beautifully said. Future projects, have you got some projects that you are working on at the moment? Not actually, but yes. Two boys are after me, they are trying to make my biography. So now, today I have done one thing with the Chile person, his name is Dauno. And he’s a very good guitar player, and he plays today in six piece, and he has recorded and he’s going to send me the copy and then you listen to that, see that. And you’re going to do some collaboration with him or was it just so you could hear his music? No just to add into the — what you call — my project. Into the biography. Very nice. And you also performed in the show Felix directed, The Prophet, tell us about that. Oh that’s okay, that’s alright. Only he was a little bit boss, bossy. No, but you know for me, it was not right. But for others, he was right. Because you say anything, I will do it. Yeah, I don’t have to talk, blah blah blah. And when he sees the other people are talking and he says, ‘Hey, no talking!’ but he control alright, I cannot blame him for that. Otherwise, they will not ever listen. And so, I’ve got one final question. The way your life has revolved around music, and all, if you could change it, would you have changed it? Or are you pretty satisfied with being a musician in your life? Up till now I’m still playing, and still teaching. So I have no botheration. I am born by the grace of God, and a good family, those who have lived longer, and healthier. My father died after 92, because of the accident. He injured his bladder very badly, like there’s a can you know? Iron can, canister, and it was an empty one, and my son leave him right in the place that he’s supposed to go to the bedroom. But it was in the middle, and he supposed to have, day after the cataract. And his cataract was completely blind. So this is in Australia? No, in Delhi. When I went there from Australia to visit my people. That’s very sad. Is there anything else you want to tell me? Bankstown, good place to live? Whatever place, if you have friends… if you complain and make an enemy for yourself, it’s not good. If you have good friends, you can live in the bloody with the bad people too.